First I want to say thank you to everyone for your encourage on my last wash day post. I had mentioned that my ends were looking kind of raggedy and a few readers commented that my ends may be weighed down by product. I think this assessment was correct as later in the week my ends looked better and I hadn't applied any moisturizer or oil to my ends in several days. I have a touch up scheduled for the 28th which will be 16 weeks post my last relaxer touch up and I plan to get a trim then. This wash day was a co-wash day. Additionally, I decided to flat iron my hair because I wanted to wear it down a day or two this week. I started by pre-pooing with a coconut oil and grapeseed oil hot oil treatment to my scalp and new growth. 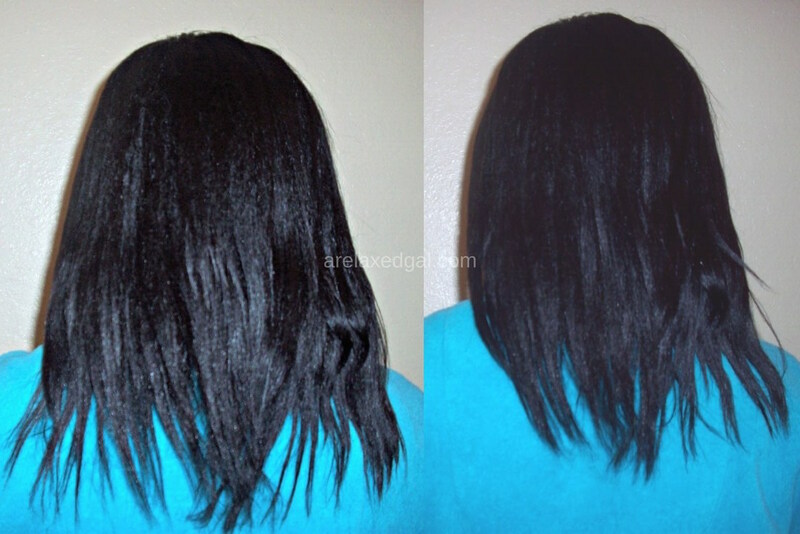 On the rest of my strands, I used Suave Natural Infusions Moisturizing Conditioner. I left all this on for a little over an hour and sat under my hooded dryer for about 10 minutes. After rinsing I cleansed with Eden BodyWorks Coconut Shea CoWash. Next was a rinse with green tea and apple cider vinegar that I massaged into my scalp for a couple of minutes. I rinsed and then applied a coconut milk conditioner and let it sit for a couple of minutes before rinsing. I dried using a t-shirt and then my blow dryer on cool. Here are the results after blow drying. 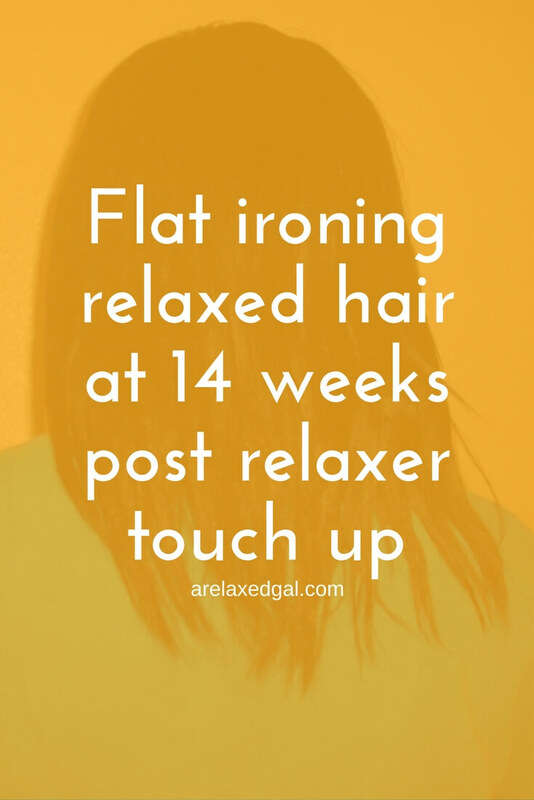 Next was flat ironing. As a heat protectant I used my leave ins Nothing But Melted Shea Butter, grapeseed oil and then Thermafuse f450 One Pass. I put the heat setting on the flat iron on 320 degrees. I didn't do more than two passes per section. This resulted in my new growth being smoothed instead of straight which was what I was shooting for. I wanted to avoid causing any heat damage to my relaxed hair and natural hair by using the protectants, lower heat setting and only two passes. The first one being it extended my wash day by an hour and a half. The second is I don't like using a lot of direct heat on my hair. I cringed every time the flat iron touched my hair despite the iron being on 320 degrees, using a heat protectant, fully drying my hair prior and not flat ironing my ends. A couple of days later I wore my satin pillow rollers to bed and wore my hair in a half up, half down style. It looked pretty good though the curls fell throughout the day because I didn't use any setting lotion. This wash day went well and I'm looking forward to next week because it's going to be a clarifying wash day and is my last one before my relaxer touch up. What products do you use when you flat iron your hair? Your hair is so shiny! I LOL @ the cringing part. I am the exact same way, but I am just paranoid...I have not flat ironed my hair in YEARS. Those loose curls are cute! 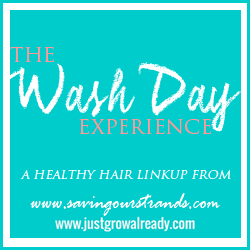 It's awesome that the advice from the other #washdayexperience ladies worked for you, this is one of the reasons why I love the link up. Your hair has amazing shine, I can't wait to see you touch up results. Satin rollers for the win! I really need to use mine more often! I love Chi Silk Infusion when I flat iron my hair. It's light, a heat protectant, and gives my hair CRAZY silky shine. I think that you are going to be pleasantly surprised at how much length you retain after your next touchup! Your ends look healthy to me. And I love that style you did, its very beautiful. Your hair looks amaaaazing Leah!! Its so thick! Thanks for great share dear. You know whenever I have to go on outing I just use flat iron to style my hairs. Within few minutes my hair look so beautiful. I can do any hair style with help of the iron. It’s safe too fir my short hairs. Your hair is really thick, and those satin rollers gave you a nice curl, and the shine? Amazing! !